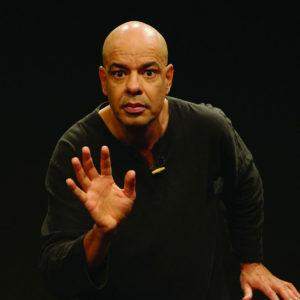 Workshops & Coaching | Solo Performances and Coaching Services | Antonio Rocha Inc.
Transitions—the moments in a story where we shift between one thought and the next—are hidden gems tucked away in a story well told. Whether you’re your family’s unofficial historian or a professional teller, learning to master these moments will give your stories extra polish and finesse. This workshop will teach you how to identify and develop the transitions within your stories by practicing techniques with voice and body language. This workshop focus on individual creativity with the use of body language and mime techniques to make the invisible visible, therefore creating atmosphere and seamless transitions. Studies prove that body language accounts to more than 70% of how we communicate, what we say has very little to do with what we mean. 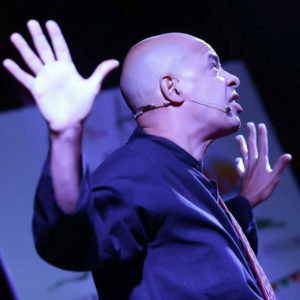 Antonio is a dedicated teacher and his 30 year experience as a solo performer will guide you with care through these discoveries. This is a participatory session, filled with fun and movement. Learn how to explore these tools in a fun and safe environment and your stories will never be the same. This workshop is for discovering the five different voice resonators (chest, neck, mouth, nose and head) and how we can create fun characters and sound effects with them. It is useful for all styles and genres of storytelling. The teller can have his/hers own voice when narrating. However it is very helpful to create different voices for the characters in a story. By doing so, you will have a presentation that will flow better from scene to scene, you will have more clarity in your delivery and then be able to eliminate a series of redundancies that tend to slow the story down. You will also learn a series of sound effects in this session that will benefit some of your stories and transitions. I have been asked over the years to share the techniques of how I present my stories through workshops. That is how the workshops came to be. While workshopping, after using examples from my own work to illustrate what I am teaching, I find that it is refreshing to end a workshop showcasing one of the participants work. I do that by having one of them stand up and tell part of a story for me to coach him/her with the techniques that I have introduced in the workshop. That is where my coaching business is coming from. People see that I am serious, transparent and above all I create a safe space for the person being coached to explore all possibilities. I want my clients to succeed and not just learn a lot of techniques and not know how to process it into a performance. I want the client to be calm and feel that it is through trial and error that we can achieve the best results. I welcome mistakes and turn them into teachers. The client’s success is my success. The techniques I use have worked for me over the past three decades. These are techniques that I also see being used by the best in the business. Once you practice them in your stories your presentations will go to the next level and there is no going back. Stories in the business world are not presented with the same dramatic tone as they are by professional performers. However you want to create the same everlasting impact. They must evoke emotion. Emotions connect with the values of the listeners so they are more likely to take action. There are stories that will be part of the branding process of your company. There are stories to be told in order to make a point clear and in order to sell a product. These are persuasion stories. Even TV commercial tell a story these days. They call it a dramatization. So, what is your story and the stories you can gather in order to use them at the drop of a hat? The larger the story arsenal the better chances you have to persuade. Together with you, I will make sure that you create the building blocks for a storytelling culture in your company that will take your business to the next level, both in branding and communication skills amongst the various departments therein. These are key ingredients for company growth and vision. The various departments of your company, like a quilt, should be held together by a common story, especially as it grows into new markets. The central story and it’s various narratives create a business culture that won’t let any new growth run your company astray. 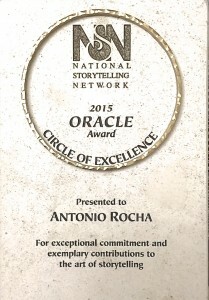 Antonio Rocha knows how important it is for an organization to get its story right. He expertly guided our team through the discovery of our nonprofit’s origin story, and worked one-on-one to prepare us for situations that call for its compelling delivery, including elevator pitches and donor lunches. He called our attention to the subtleties of gesture and the importance of personal connection, showing that a story is so much more than just words. I am very grateful to have benefited from Antonio’s storytelling coaching – he helped to set our foundation’s story on the right track!